This is one of the cutest gifts especially designed for twins! It is perfect for a baby shower or to welcome the two bundles of joy home from the hospital. 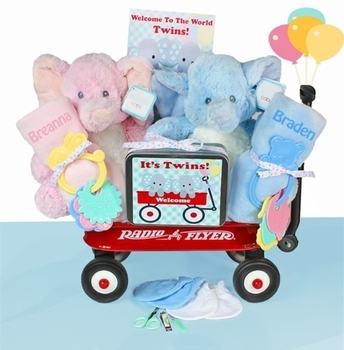 The gift basket is a genuine mini Radio Flyer wagon filled with two adorable plush elephants, some baby necessities and two ultra soft travel blankets. You can select pink or blue for the elephants and blankets depending on the genders of the babies. Each blanket includes each baby’s name professionally embroidered for an extra personal touch and certain to be treasured as lovely keepsakes. The babies will definitely love the minky soft fabric on their delicate skin as they snuggle up at nap time. We also add two rattle teethers, plus a coordinating gift card and tin gift box which contains two pairs of infant scratch mittens and a baby manicure set! Everything arrives fully gift wrapped in clear cello or tulle for a beautiful presentation! This is a really cute gift and the parents were very happy with everything, especially the blankets with the names added to them.